When spending time on a charter with the crew of Wild Hearts, you’re going to hear them using a unique language. Sailing terms are an extremely useful way to communicate on board a sailboat. When on the water, calling out “right” or “left” could get confusing, but using “port” or “starboard” instead can ensure everyone is on the same page. Enjoy this list below so you can stop speaking like a landlubber! 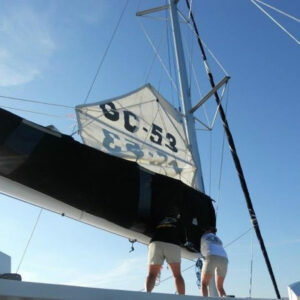 Boom – This thick pole runs along the bottom of the mainsail. Bow – The front of the boat. Heeling – The term used when a sailboat leans over in the water by the force of the wind. Helm – Commonly known as the ship’s wheel, this is how a boat is steered. It can be a big wheel or a tiller on a smaller boat. Jib – One of the sails, it is forward of the mast. It does not have a boom. Jibe – Similar to heeling, this is when you bring the stern of the boot through the wind. Keel – The is the fin on the bottom of the boat that sticks into the water. It helps keep the boat stable and prevents capsizing. Leeward – The side of the boat farthest away from the wind. Lines – The ropes on the boat. Mainsail – This is the largest and most important sail, triangular in shape. Port – When facing the front of the boat, this is the left side. Starboard – When facing the front of the boat, this is the right side. Tack – When used as a verb, it means to change direction by turning the bow of the boat through the wind. As a noun, the tack is the course you’re on, relative to the wind. Windward – The windward side of the boat is that closest to the wind. Memorize this list so next time you’re on the boat with Sail Wild Hearts, you’ll be able to speak their language.